Diesel fuel treatments are recommended for cold weather operation for a variety of reasons. Moisture condensation in diesel fuel during cold weather is one such reason. Most diesel engines are factory equipped with a fuel/water separator to trap water before it can reach the injectors. 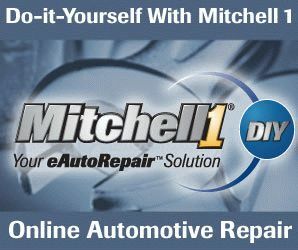 Water contaminated diesel fuel can corrode and damage expensive injectors, especially high pressure common rail injectors on late model trucks. It can also react with the fuel and cause gums and varnish to form in the fuel system. Moisture can also make biodiesel mixtures unstable, and it can even promote the growth of microbes inside the fuel tank! A moisture dispersing diesel fuel additive can help rid the tank of unwanted water while preventing fuel line freeze and protecting the injectors against problems caused by excessive water in the fuel. Use a moisture-dispersing additive every fill up during cold weather (below 32 degrees F.), or every third or forth fill up during warm weather for preventive maintenance. If you live in a wet climate, then using a moisture-dispersing additive more often would be recommended. The cetane number (CN) of a diesel fuel is a measure of the fuel's combustability. The higher the cetane number, the easier the fuel ignites and the faster it burns. A higher cetane number improves cold starting and cold idle while reducing emissions. Higher cetane numbers may also be required for higher revving engines. As far as performance and fuel economy are concerned, you don't really gain anything by raising cetane. The engine only needs a certain amount of cetane to start and run properly. It's like putting premium gasoline in an engine that only needs regular gasoline. The engine won't run any faster or make more horsepower. But a diesel will start easier and run cleaner. This can reduce the frequency of regen cycles on late model diesels with exhaust after treatment systems, and prolong the life of the Diesel Particulate Filter (DPF). The minimum cetane number specified by U.S. law for ultra-low sulfur diesel fuel is 40. Some states have higher requirements to reduce emissions. California requires a minimum cetane number of 53 while Texas requires a minimum cetane number of 48. In Europe, the minimum is 51. Straight biodiesel (B100) typically has a cetane number of 47 while B20 biodiesel (20 percent biodiesel) is usually around 42. The actual cetane number of the fuel at the pump will depend on the type of crude the fuel was refined from, the refining process itself and the additives put in by the fuel supplier. The cetane number of #2 diesel at most pumps can vary from 40 to 44, except in states that require a higher rating where the fuel should meet the minimum standard for that state. The most common cetane booster is a chemical called 2-ethylhexyl nitrate (EHN). If a fuel has a low cetane number (less than the minimum required by law), it will burn more slowly possibly causing cold starting problems, blue/white smoke in the exhaust following a cold start, more engine rattle and black smoke in the exhaust when accelerating. If you decide to use a cetane boosting additive in your vehicle, follow the dosage directions on the product. Most products that contain EHN will require about 6 ounces to treat 20 gallons of fuel. Overdosing the fuel with extra cetane booster won't gain anything. The best results are usually obtained by increasing the cetane number into the 48 to 52 range. Fuel waxing and gelling during cold weather can also be a problem depending on the grade of fuel. Diesel #2 has an oil-like consistency that can thicken an gel when temperatures drop below freezing. This can plug the fuel filter and lines, preventing the engine from starting (or causing it to stall). "Winter grade" diesel fuel (Diesel #1) is thinner and more volatile so it is less susceptible to gelling at low temperatures. But it is also more expensive and contains less energy (which reduces fuel economy). Mixing #1 diesel with #2 diesel can provide more protection against cold weather waxing. The alternative to buying more expensive Diesel #1 during winter months is to use a diesel fuel treatment that reduces waxing to prevent gelling. Some of these anti-gel additives will lower the pour point of the fuel down to -65 degrees F.! Multi-purpose additives may also boost cetane, help disperse moisture and improve lubricity for the injectors. Recommended usage: Add to the fuel tank BEFORE cold weather arrives. One bottle of product will usually treat up to 20 gallons of fuel. 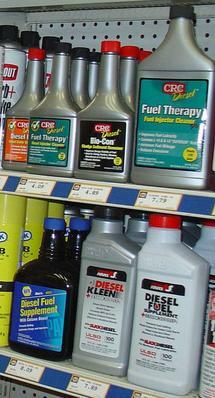 There are many specialized diesel fuel additives. Some products are for specific problems. Others are for preventive maintenance. Gum and varnish can build up inside diesel fuel injector nozzles over time, restricting fuel flow and power. Adding a product that contains injector cleaners and detergents can prevent these deposits from forming, and remove accumulated deposits from dirty injectors. Most diesel fuel treatments also contain rust and corrosion inhibitors, fuel stabilizer, cetane booster for added performance, and lubricants for the injectors and high pressure injector pump. Recommended usage: Use as needed, and follow the directions on the product for best results. Growth of bacteria in ultra-low sulfur diesel and biodiesel has become more of a problem in recent years for a couple of reasons. One is that the reduction of sulfur in ultra-low diesel fuel means there is less sulfur to hinder bacteria growth. Ultra-low sulfur diesel also contains a higher percentage of parafins (waxes) that provide a food source for bacteria. With biodiesel, the potential for bacterial growth is probably 10 times worse because biodiesel contains digestable vegetable oils and sometimes animal fats. Bacteria also need moisture, so once they have water and a food source inside the fuel tank they start to grow. As slime forms inside a bacteria-contamined diesel fuel tank, the fuel may take on a rotten odor. Bacteria also secrete organic acids that can be corrosive to steel fuel tanks, injector pumps and fuel injectors. Eventually, the slime growth will clog or plug the fuel filter starving the engine for fuel. Diesel fuel test kits are available that will reveal the presence of both bacteria and water in a fuel tank. If your fuel tank is contaminated, you need to kill off the bugs with a biocide treatment. There are two different types of diesel biocides. One type dehydrates the bacteria causing them to die, or prevents them from feeding and growing. The other type disperses water in the tank, depriving the bacteria of the moisture they require to feed and reproduce. A good biocide treatment will typically kill 92 to 98 percent of the bacteria in a diesel fuel tank after 7 to 10 days if the vehicle is not drive. Most will kill 70 to 80 percent of the bad bugs within 24 hours. So the secret to completely getting rid of the troublesome bacteria is to let the fuel sit as long as possible after the initial treatment. Always follow the dosage directions on the product (1 ounce will typically treat up to 30 or 40 gallons of fuel). Pour the product into the fuel tank, then add additional fuel to mix and blend the biocide with the fuel that is already in the tank. Then let the mixture sit while the biocide goes to work. The dead bacteria and slime killed by the biocide will usually settle to the bottom of the fuel tank, so if the tank has a bottom plug, draining some of the fuel following the treatment would be recommended. Also, plan on changing your fuel filter following a biocide treatment. To reduce the risk of repeat contamination, add a moisture dispersing additive to the fuel when you fill up, and add a dose of biocide every few months or as needed to prevent the bugs from returning.